Nokia has announced three new phones, the 5530 XpressMusic, the E72 and the 3710 fold. 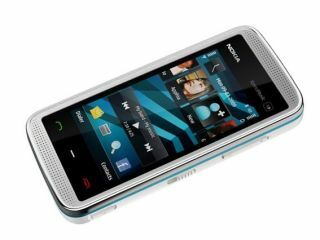 The headline act of the three is the 'youthful' 5530 XpressMusic, which will be the successor to its popular 5800 – a full touchscreen model and is built with social networking and, as you may have guessed, music playback in mind. The phone comes with a 4GB memory card, boasts 27 hours of playback and a 2.9 inch touchscreen. "The Nokia 5530 XpressMusic follows in the footsteps of the top-rated Nokia 5800 XpressMusic, expanding the touch XpressMusic phone range with a youthful device that has a solid stainless steel frame finish and comes in five vivid colors," said Nokia. The Nokia 5530 XpressMusic ships in late Autumn and has been priced at €199 (c£170). Next up was the successor to the E71, the E72 – pitched squarely at businesses and featuring a full qwerty keyboard, a better camera, Instant Messaging capability and a standard headphone jack. "Despite the outstanding market performance of the Nokia E71, we still continually look for ways to enhance the device," said Ilari Nurmi, Vice President at Nokia. "So we included the desktop like email experience from the Nokia E75 and gave it a new optical navigation key for more intuitive scrolling through menus, emails and fast panning of images. "We also upgraded the camera to 5 megapixels and added a standard 3.5 mm audio jack." The E72 is also scheduled for Autumn and weighs in at €350 (c£300). Last, and probably least, is the Nokia 3710 fold phone – a clamshell that has been priced at €140, which works out at about £120 in the UK. "There is a solid demand for good-looking, intuitive and easy-to-use handsets with modern features," said Markku Suomi, Vice President, Connect devices. "The Nokia 3710 fold packs in a renewed, but instantly familiar user interface that makes the appealing array of features enjoyable to use, offering great value for money." The phone is expandable to up 8Gb with an optional micro SD card, has a 3.2MP camera and the case features what Nokia describes as an 'eye-catching' pattern on the cover.